Great for respiratory support, antibacterial, immune boosting, and calming. All herbs were grown in my gardens. 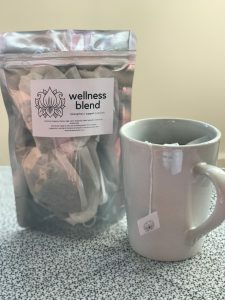 This particular recipe was developed from combining three herbal tea blends (winter wellness, winter blues, respiratory support). The winter blend was created for immune boosting properties. The respiratory blend was to help fight a nagging, lingering, dry cough. The winter blues was designed to fight off seasonal depression from too short of days and too many gray days. There are no chemicals used on the herbs. All are hand picked, dried, and packaged by Wendy. 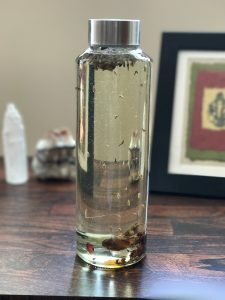 This oil is for abhyanga but could be used as a daily moisturizing oil for your body. Each oil is custom blended to your body type (take the quiz here to learn yours) and needs. Each bottle has flower pedals and small crystals. 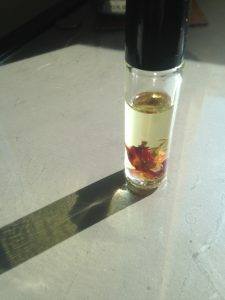 From Hot Flash to Hot Stuff this blend is for women going through the change of life. You know who you are! Slim and Trim is a weight loss supportive oil. Stress Free helps ground you and keep you calmer. Take these little gems with you. Bug Free is my go to for avoiding ticks, no-seeums, biting flies, and mosquitos. Seasonal Blend this is for helping you stay balanced seasonally. I use the spray version of this in my classes and students love it! 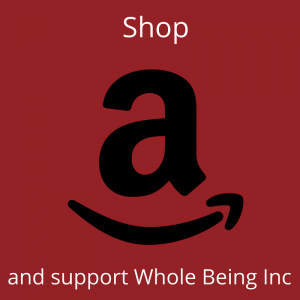 If you’re shopping Amazon, use this link and support Whole Being Inc podcasts and free programming. 1/4″ thick (6.3 mm) and provides a more distinguished look. The 1/4″ thickness cushions your impact, while the texture provides extra grip during poses. This is the mat I have been using for the past year and I LOVE it!